This is the kind of book that loses me. I get confused trying to remember all the detailed info I just read. That said, I'm listening to the audiobook and thinking " I should be taking notes! I'm never going to remember all this." Maybe if I were a doctor this would make more sense, but I feel much more prepared to have a more meaningful conversation, that makes sense, with my endocrinologist at my next appointment. The take home I got from this book is; what I'm currently doing to manage my health isn't working, but there are other methods available. I have modified my diet after listening to this book and I am truly amazed at the improvement in my overall health. Very comprehensive book on thyroid and how nutrition and lifestyle play a role. The narrator talked very fast, but very clearly. I had to listen to it twice and took notes. If you are tired of adjusting medication and still have symptoms this book is for you. Even if you are not on medication, but you think you have symptoms of low thyroid, this book is for you. I'm still not sure if the book was really read like all the others or if the narrator just went in and read some random words that someone then put into order. It sounds like a robot's voice with very bad pronunciation and really obvious cuts in the middle of a sentence. On top of this, the tempo is very fast, which I usually don't mind. But this is a highly complex topic with lots of medical terms that shouldn't have been sped up like this. The book itself was very informative. I also bought it in paper back just because it's a great resource to have and I find it much more handy to look up stuff in a physical book than an audiobook. I'll probably not listen to it again though, just because the "narration" was so awful and distracting. I think all doctors should read this book before they prescribe the wrong drugs that eventually will lead to worse problems for patients. Started out good with helpful information. Got a bit technical to listen to and then made me glaze over listing off supplements. Great information in trying to figure out what's going on! It is quite detailed, and overall not too "medical". Very informative. There's much more to reversing Hashimoto's hypothyroidism than taking a pill. Read the book! Good book but it's a difficult read! This is a very informative book! Reccomend if you have a Hypothyroidism. This is a must have book for anyone dealing with thyroid issues including Hashimoto's. Filled with concrete information and suggestions for healing. Absolutely LOVED this book by Dr. Kharrazian. Although a lot of it baffled me (the recommended vitamins and minerals as I have never heard of them and wouldn't know where to begin getting them from) I really enjoyed listening to the book. Had I bought it to read I would have switched off, however on audible, it felt like it was being explained to me. There are so many factors to hashimotos disease and although my lab work is saying I am being treated successfully, I still have the symptoms of hypothyroidism. This book links and demonstrates other disorders and or intolerances which either can play a part or being the root cause of the thyroid disorder. I certainly will be reviewing my diet. A major downside to having this on audible is the lack of chapter titles making dipping in and out of subjects harder. I recommend bookmarking chapters as you listen to them and assigning titles. I may go on yo buying the book for reference. What made the experience of listening to Why Do I Still Have Thyroid Symptoms? the most enjoyable? The narrator was clear, well-paced, enthusiastic - helping to maintain interest in more complex areas of the book which could have sounded very laborious given the level of detail. I am a naturopathic nutrition student, so I bought this book to help me with an assignment and my understanding of the thyroid function, and hoped it would also relate to the rest of the body. It does! Treating the body and mind as a whole is how the author approaches thyroid problems - wonderful. He also clarifies the difference between hypothyroidism and Hashimoto's. He clarifies a number of topics which have so far remained hazy to me in my lectures. There is a LOT of detail, so I have now bought the paperback so I can refer to the 'charts' and 'solutions' on a more regular basis, to increase the solidity of the knowledge gained. Wonderful book - very happy. What does Keith Michaels bring to the story that you wouldn’t experience if you had only read the book? His enthusiasm, energy and emphasis upon certain words is paced beautifully. I am also hard of hearing, so, the clarity and pace were appreciated further. I am not able to read books whilst driving or walking my dog, this is the benefit of audible. However, I have since bought the paperback due to the detail in the book and wanting to review it. Keith Michaels however, I will be listening to again, and am happy to listen to this book all over again - thanks to his narration. It made me have eureka moments, where clarity and interest in a point climaxes to the moment of understanding and hopefully, will eventually become knowledge. I found myself relaying information in the book to friends and family, as it excited me to know and understand the topics in the book. Just, GREAT book! 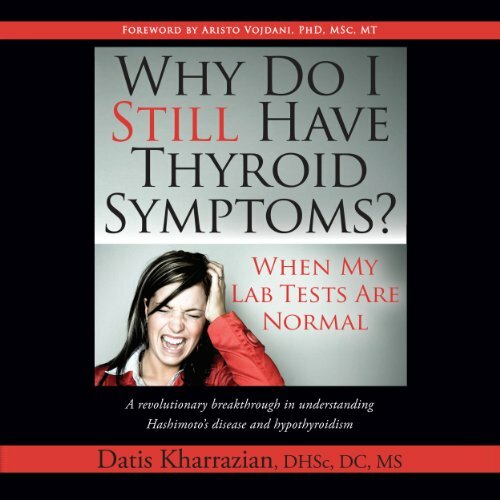 You'll probably want to buy the paperback if you intend to act upon the recommendations within the book, to have it to refer to for test results (from the doctor) and help you if you, or someone you know, has problems with their thyroid - or rather, is showing symptoms of thyroid problems. If you are interested in nutrition also, this book will demonstrate the affect nutrition has.